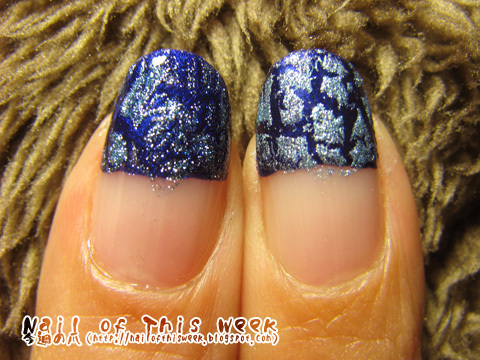 #021: Blue crackle straight-line french : Nail of This Week. 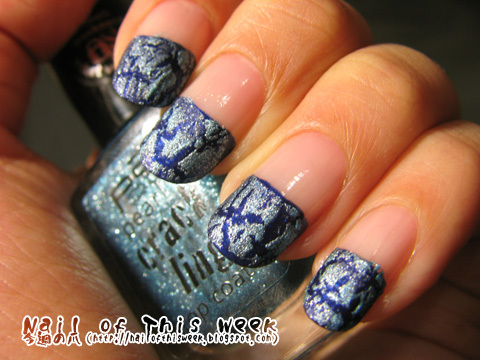 Do you like crackle polish? As you know last year was BOOM on crackle polish, driven by manufacturers but not by users at all, which made pretty a lot of polish-fanatics fed up of them…so do I. Crème-finish crackles, it wasn’t my taste, I don’t own any of shatters or crackle-glazes; but while I found some of so-called “pearl-finish crackle” in my local drug store, I felt like “Okay at least I should try them”, and…actually I might say I love this “pearl crackling” series from P2. 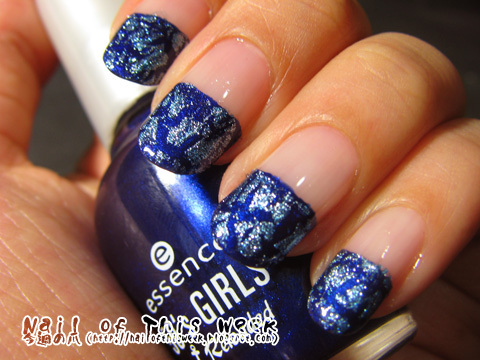 …but I like to finish by adding glossy topcoat because as soon as topcoat covered the crackle it BLINGS! It’s not “pearly” anymore but instead it looks very shimmery or even glittery! I love the way it crackles, as crackle-looking really depends on it’s formula (and this is another reason I don’t feel buying shutters), this one is perfect for me. Good finish, good formula, and what else? This also has very good price, 1.75 euro for 11 ml! It’s a bit small bottle but only one coat is needed and for sure it’s not for everyday-nail-painting, I think this is really enough. Blue thunder is my favorite, but I have others in my stash waiting for my next use. But anyway, good job P2! !